Home / Do Fire Sprinklers Really Save Lives and Property? 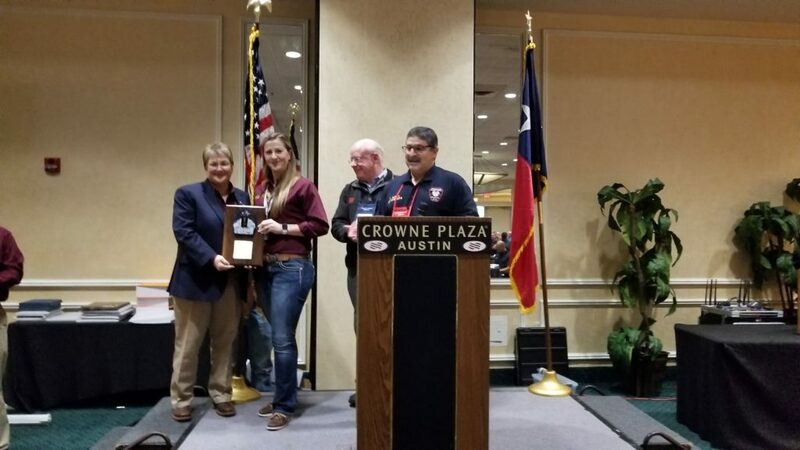 Harris County Fire Marshal Laurie Christensen and Harris County Public Information Officer Rachel Moreno receive award for the most reported sprinkler saves in Texas by the Texas Fire Sprinkler Coalition. Harris County is the 3rd most populous county in the United States with over 4.7 million people. Harris County Seat is Houston, TX (which is the 4th largest US City). At the beginning of 2018, the Harris County Fire Marshal’s Office began tracking the effectiveness of fire sprinklers, by documenting each time fire investigators responded to a fire scene in which a fire sprinkler system activated. By tracking fire sprinkler activations, HCFMO found fire sprinklers: saved $144,266,225 in property, no fatalities or injuries were reported; and in 93 percent of the sprinkler activations, only one sprinkler head activated. What do these statistics tell us about fire sprinklers? Multiple fire sprinkler heads activating at once is a myth. Fire sprinklers work, there is no doubt about it, and the numbers prove it. In 27 fire incidents that were reported in 2018, the losses were just over $11,000,000, with pre-incident value at over $155,310,275. Without fire sprinklers, the damage done by fire would have been exponentially higher. The numbers also show no losses of life or injuries in any of these fire incidents. Those two statistics show the effectiveness of fire sprinklers, without a doubt. 13 of these fire sprinkler activations occurred in apartments, where there is a high density of people living. These sprinklers controlled the fire until the fire department arrived, allowing for the safe evacuation of the apartment building. What else did the fire sprinklers do? Fire sprinklers minimized the damage, and numerous families were not displaced due to fire. The cost of repairs and relocating one or two apartments is far less than losing an entire building and relocating 10 or more families. There is no price, no number, you can put on a human life. The safety and security fire sprinklers provide to residents are also priceless. We all know fires can happen anywhere, at any time. When a fire sprinkler is present, the likelihood of massive property damage and loss of life is dramatically reduced. Harris County fire sprinkler save numbers also show fire sprinklers operate individually, not collectively. This dispels the myth that when one fire sprinkler activates, they all activate. Hollywood and movie makers have perpetuated this myth in numerous movies, for more dramatic scenes. Truth be told, fire hoses used by firefighters put out more than ten times the water flow per minute than a fire sprinkler. What does this mean? Fire sprinklers produce less overall water damage than fire hoses. From the time a fire is discovered, it can take a fire department between four to eight minutes to arrive. In this amount of time, tremendous smoke and fire damage can be done. Fire sprinklers react, responding only when temperatures near the sprinkler reaches 135-165 degrees Fahrenheit. The water released from the sprinkler is designed to last for at least ten minutes, which is enough time to extinguish the fire or keep it under control until the fire department arrives. Fire sprinklers are a proven way to protect lives and property, as demonstrated by the $144,266,225 in property that was saved in unincorporated Harris County during 2018. As we continue to track fire sprinkler saves, more information can be provided to show the effectiveness of fire sprinklers.